Signing a Prenuptial Agreement: What Does It Really Feel Like? 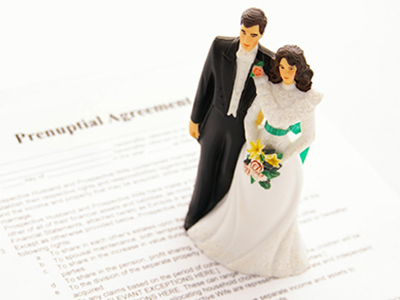 Deciding on the terms of a prenuptial agreement can be stressful for any newly engaged couple. Lawyers, contracts, and negotiations are topics that can be overwhelming when you’re also planning a wedding! However, the process of signing a prenup can surprisingly bring you closer to your significant other when you take the proper precautions and steps. Lindsey Stanberry, author of REFINERY29’S MONEY DIARIES, shares the experience of one woman whose bond with her S.O. was tested but ultimately strengthened by this process. Discussing your finances with your S.O. gets a whole lot more complicated when they are set to inherit millions of dollars. Meghan, 30, shares the story of how she and her now husband navigated the stressful process of signing a prenuptial agreement on their way to finding their happily ever after. I met my husband on a plain old dating site. I share this detail as proof that when I first set eyes on Mike, I had no way of knowing that his family was exceedingly wealthy. He lived in a normal apartment. We took turns paying for dinner. Eventually, when we moved in together, we split the rent and our furniture was secondhand. And so you can only imagine my shock when, five years into our relationship, Mike inherited millions of dollars. Yet this windfall didn’t really change our daily lives. In fact, the impact of Mike’s fortune on our relationship didn’t come into focus until after we got engaged, when I found myself in the office of a high-powered attorney, a 40-page prenuptial agreement staring me in the face. I grew up in a middle-class family; both my parents worked, and I was raised with the understanding that nothing would be handed to me. I paid my own way through college, and later worked a full-time job and a part-time gig while going to graduate school at night. This independence was a point of pride. Mike often told people that my “scrappy” spirit was one of the things that attracted him to me. I appreciated that he didn’t try to water me down. He appreciated my fierce ability to fend for myself. But I felt far from fierce sitting with my lawyer, who charged almost $900 an hour. (Mike, I’ll admit, paid the fees.) “The way this contract stands, you can never stop working,” she said. I had no plans to give up my career, but it was gutting to read the terms spelled out by Mike’s attorneys. The agreement made it clear that even married, Mike and I would not build a financial future together. I came home from that first meeting in tears. I wasn’t initially upset about a prenup because I trusted it would be fair: If our marriage didn’t work out, Mike would rightfully walk away with the bulk of his money. But I had assumed I would still have some piece of the life we were both invested in. Instead, what the contract spelled out was a flat fee for each year we were married, with my annual “value” increasing slightly if we had children. “That’s what I call the ‘breeder clause,’ ” my lawyer scoffed. If she meant to rile me up, it worked. I got angry thinking of my soon-to- be husband becoming the de facto CEO of our relationship. Mike seemed genuinely concerned that I was upset. It was clear that my ability to contribute financially to our life together was limited compared to his, and to me, this meant that even if we discussed financial decisions, most final calls would be his. The back-and-forth between our lawyers went on for months. But in the comfort of our home, Mike and I were doing our own negotiations. We had a lot of hard conversations about how we saw our marriage; what a real partnership looked like, both from a financial and nonfinancial perspective; and how our different upbringings shaped our views. There were a few tears, but also laughs, and ultimately so much excitement for our future. Unexpectedly, the process brought us closer. Two weeks before our wedding, Mike and I signed the prenup. We took out the “breeder clause,” and my earnings are protected. It’s not perfect, but it was weirdly comforting to go into marriage knowing we could work as a team. Want more? 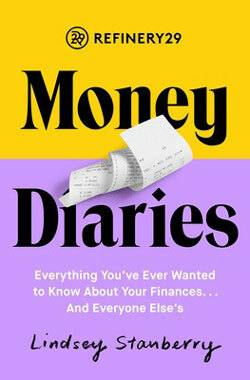 Discover all sorts of fascinating financial tips in MONEY DIARIES by Lindsey Stanberry. BONUS: Be sure to check out Why Talking about Money Shouldn’t Be Taboo and Other Tips from MONEY DIARIES from Get Literary! Excerpted from Refinery29’s Money Diaries by Lindsey Stanberry. Copyright © 2018 by Refinery29. Used by permission of the publisher. All rights reserved. Money Diaries, the breakout series from Refinery29, offers readers a revealing and often surprising look at the personal finances of others: what they spend, how they save, and even the purchases they hide from their partners and friends. Featuring all-new Money Diaries, valuable advice on how to get rich (and afford life in the meantime) from a handpicked team of female financial advisers, and money challenges that will save you up to $500, Refinery29's Money Diaries will empower you to take immediate control of your own money. With a vision of what your dream bank account balance looks like, some expert advice to help you achieve it, and the support of a powerful community with the same goal, you’ll be a step closer to taking control of not just your wallet, but your life. Share Signing a Prenuptial Agreement: What Does It Really Feel Like?